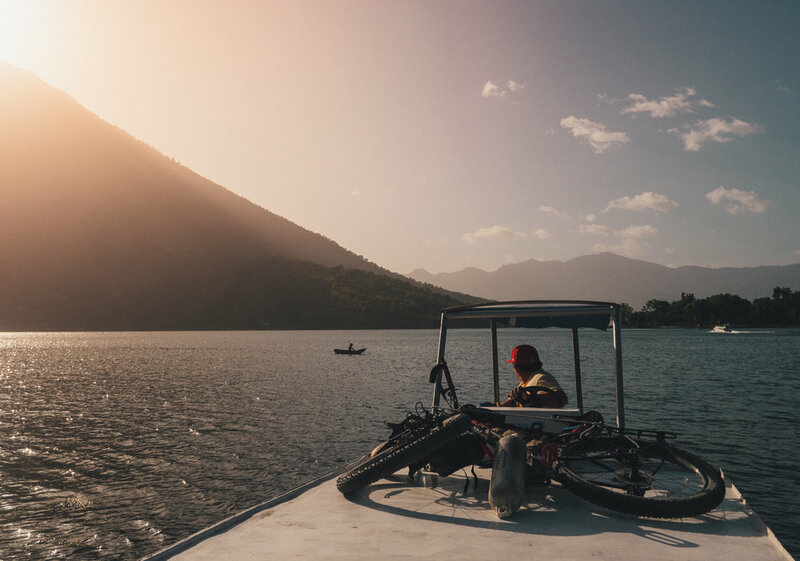 Direction wise, Lake Atitlan means heading back to Vancouver - it's been an odd loop around Yucatan and basically heading back east now - but what I have heard about this place, it must be worth it. I reach the lake from the West side after two days riding from Antigua. 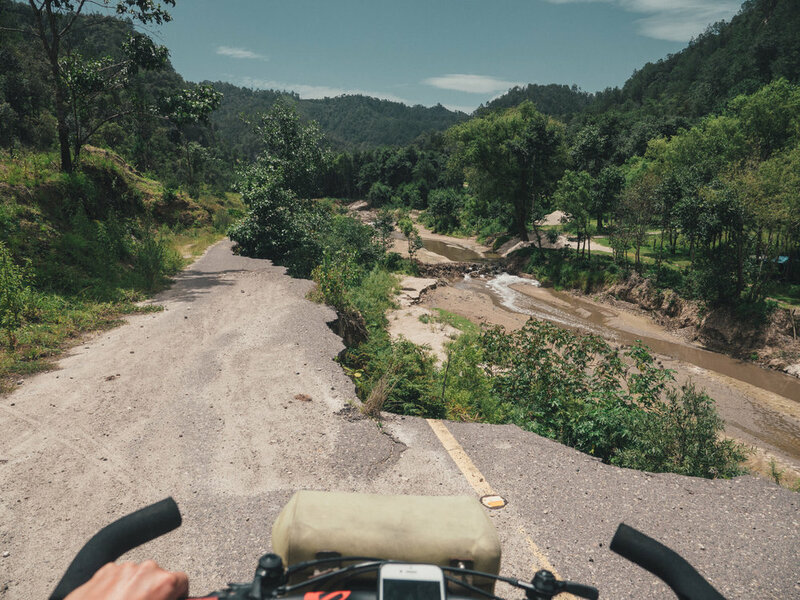 The road is no different than the days before: winding and hilly, with steep grades. My destination for the coming days is San Pedro La Laguna, a small coffee town underneath its sleeping volcano (in the middle of the top photo). Sometimes the road is so steep I have to push. One bridge is washed away, but the river is only half a meter deep, which is an easy crossing. For the last bit I short cut the route by taking a small boat towards San Pedro. 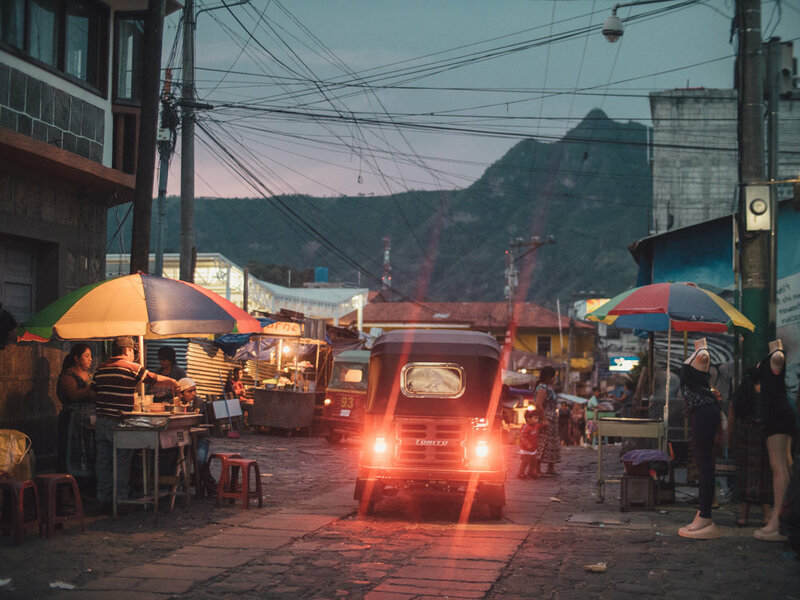 It's a happy chaos in San Pedro when I arrive at the end of the afternoon, with rickshaw taxis and motorbikes rushing through the narrow streets, vendors and food stalls selling their wares. 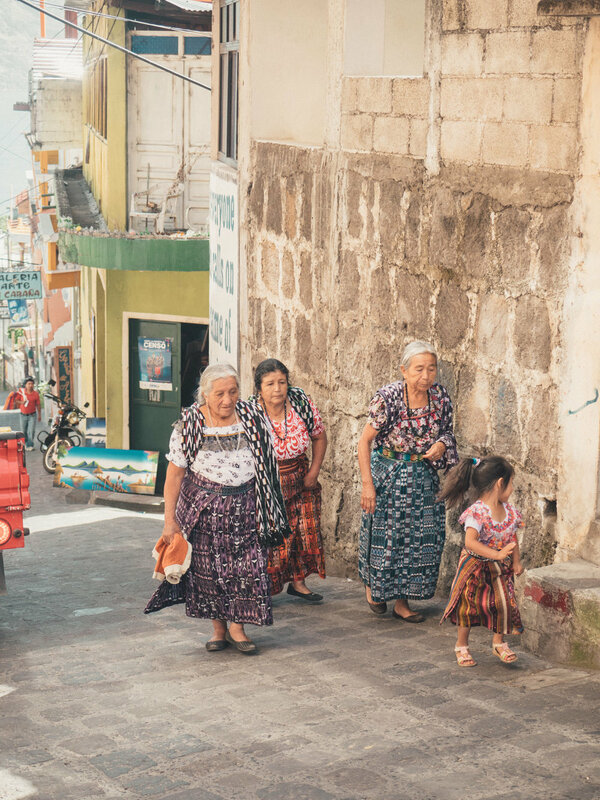 The Mayan culture looks authentic and untouched, with women - young and old - wearing colourful traditional skirts and dresses, old men with deep lines in their faces, having working the coffee plantations for a life time. First I reach the centre of town, where its busy with street vendors selling food and vegetables. I only spot locals here. Most of the visiting tourists are on the street along the lake, where most of the hotels and restaurants are. Tourism is fairly low profile here, no fancy resorts. Hotels are usually small family businesses and there are lots of things to do around the lake, including kayaking, swimming and coffee tours on the plantations. The hotels are cheap, but the food is great, ranging from local dishes to international cuisine. My favourite was Sababa, a nice little gem selling Israeli food, with a view over the lake. Afternoons I spend at the lake side, where I sit and read on an old concrete wash board, watching the people around me. Women doing laundry, little children playing in the water. Next to me a man is wet-shaving his beard. He probably just finished work. Boys are diving from the rocks impressing each other with salto jumps. Further ahead water taxis transport people from one lake village to another. It seems people have a worry free life in San Pedro. It would be easy to settle here, like the German who is in the room next to me. He permanently rents it long-term for 5 Euro a day (I pay 7). 10 years ago he quit his job and since than he has been travelling, mostly staying in places for a few months. India, South East Asia, The Philippines. He returned once to Germany to try to settle again. All his friends had started families in the time he was away - he fell out of touch so continued travelling and now settled in San Pedro for unlimited time. I think it's easy for world travellers to settle anywhere. You are able to adapt quite fast. The extremely low costs of living in developing countries can make it attractive. I think he doesn't do much else than reading books in the hammock and enjoying the view. Life is slow here. For me this kind of living only works for a few days. Then I got the itch again, I need to move on, a project to do. If I can't create or do things I get unhappy. Even in a perfect place like San Pedro. The second day I go for a hike up the ridge called Indian Nose, called after the shape of the summit. Tours are being organised including guides and food, with shuttles leaving from town early morning, but I prefer to go on my own and take a longer walk from San Pedro. The alarm is set to 3am. After making coffee and an egg sandwich I leave San Pedro in the dark. Everyone is still asleep. The first hour goes through town, along the lake to the next village San Juan. I meet a man with a deformed face who wants to talk to me, I'm not sure what he wants at this hour of day. We wish each other a good day and I walk on. Dogs bark when I pass homes. at 4.30 I reach the end of the village where the trail starts going up. It's still dark. In the light of my head light I see the coffee bushes on my side, with green beans. On the floor are overripe avocados, half eaten by animals. Behind me the lights of San Juan get smaller and more plenty. The dogs howl. As I walk up on a switch back trail, the sky slowly becomes blue over the lake. I haven't seen anybody else. The people taking the tour, went in small busses around the mountain and did the shorter hike from the other side. I prefer doing this on my own, without countless local guides asking for tips. Once up on the ridge line the trail continues slowly going further up through green corn fields. On the right the lake takes on all colours of the rainbow while the sun rises.